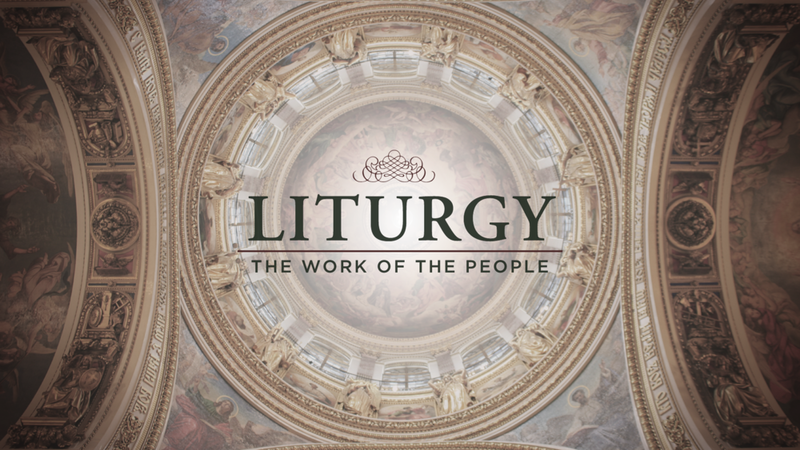 One of the more persistent phrases one hears in Episcopal Church circles is that the liturgy is “the work of the people” based on a translation of the Greek word Leitourgia. This translation of the word often is then used as a way to say that the liturgy should be more “participatory” or involve more lay people in planning or more responsive to the desires of laity. I would actually agree with all of these though I might quibble with what any of them actually means. For example, if we say the liturgy should be more “participatory” this is often interpreted as meaning lay people say more or do more. Yet in a culture in which we are constantly pressured to do and say the actually challenging act of participation may be to simply adore – to learn to be present with our hearts opened to God’s. Yet, my real frustration lies with the fact that this way of understanding the Greek simply is faulty. The word Leitourgia might much more accurately be described as “work for the people.” The word describes building projects critical to a community’s ongoing life. It might refer to a temple or bridge or the like. The work was done by members of the community but might be sponsored by a wealthy patron. The work for the people was the work that was done in response to a critical need in the life of the community. These works knit communities together and provided something crucial for them to grow and flourish. It was not about shared ownership but about shared benefit. All liturgy in the Church is a work of shared benefit – but it is not the benefit of grace for which we labor. We labor because it glorifies God. That glorification of God is a work of the people not in that it is a shared production but that it is a crucial piece of our shared infrastructure of faith. Often we’ll see a parish decide that they will give lay people an “expanded” role in the liturgy. Perhaps they’ll read the Gospel or perhaps they’ll say the Words of Institution with the priest. Sadly, this does little to actually make it the work of the people – it simply confuses the roles of lay and ordained and blurs the very distinct ministries with which we are all charged. The work of all Christians is the listen and obey God. The work of the priest is to hear the voice of God and to be faithful in administering the Sacraments. The work of the deacon is to hear the voice of God and to be a living bridge between Gospel proclamation in the liturgy and Gospel proclamation in the world. The work of a lay person is to hear the voice of God and to offer their whole heart and mind and body in worship and adoration – within the liturgy and in their daily lives. The liturgy is a place of consummate cooperation not because we all must grab our part but because we all are charged with reverent presence and adoration as its patterns of grace shape and mold us. It is the infrastructure – the critical place of encounter with one another and with God – that allows us to claim to be a community of faith. This is not, please be clear, an admonition that lay people should do less in liturgical worship. I am a huge proponent of lay sub-deacons at the Altar, of full processions, and of rich liturgical expressions that require many hands. It is, however, a reflection that we in the Church too often define “work” by how much it reflects busyness. When we say “work of the people” it implies not only entitlement but also degrades, in its own way, the role of the person who simply needs to dwell in the beauty of holiness. I read not long ago a piece decrying the traditional role of the Rector of a parish determining its worship life as “unjust” and “unfair.” Yet, our clergy are raised up by local congregations and called to serve by the lay people of their respective parishes. They are trained so that they might know the mind of the Prayer Book and formed in the movement of the Spirit that has guided the evolution of the Church’s worship for millennia. It is a “work of the people” for them to plan and say the mass with dignity and a sense of holy purpose. I hope and pray that those charged with being custodians of the Church’s worship will do so in a way that honors the gifts and talents of their congregations. It is even more critical, however, that we do so in a way that leaves them formed in the ordered patterns of centuries rather than simply given one more place to be busy for the sake of not wanting to leave anyone out. Great post again. Excellent points. I would only add another dimension to the idea of leitourgia being a “work for the people.” As I’m sure you know, another translation is a “public work.” When I think of this in terms of the liturgy, I think of the important role we all play as priests vis a vis our baptism in which we raise up our families, communities and even creation to God – our public work. Nice post. One quibble: please don’t use the term “sub-deacon”, as there is no such thing, and only serves to muddy the waters. “Lay minister” or “Lay Eucharistic Minister” says it best. LEM’s are the dear people who take the Sacrament to unfindable homes and inhospitable hospital rooms when I am too pooped by age and illness to stir after Mass. Instead of “sub-deacon”, would you propose “para-deacon”? There is absolutely nothing wrong with the term Sub-Deacon. Quite a number of diocese, Anglican and Catholic have this legitimate ministry, whether administered by an ordained person or a lay person. Margaret, there most certainly is such thing as a “sub-deacon.” In today’s Episcopal Church, the role of the sub-deacon is most often played in the liturgy by a lay person, but there it is a distinct liturgical role nonetheless. Interesting and rich exploration which I very much like – especially your summary of what liturgy once meant in the public square. Do you not, though, end up facing both ways. Yes you value participation, but you want to be in control of it. That probably seems logical, prudent, even, to a priest; but it is experienced as a little less than participation for those of us on the other side of the table. One key question to clarify this issue is ‘why involve lay people?’ – to what end? – an eschatological question. That question gives purpose to the leader, so enables them to take better risks, whether they’re looking ten days or ten years into the future. It’s a question that priest, deacon and people can explore together, giving an abstract space for agreement before bumping into very concrete matters that they will instinctively want to fight over. Thanks for a fabulous blog.